A coyote smiles when it is happy! I have noticed coyotes smile especially during and after playtime. And, I have had a coyote seemingly smile at me: “Hey, I see you down there and I’m okay with that.” Facial expressions function the same way in coyote society as it does in human society. 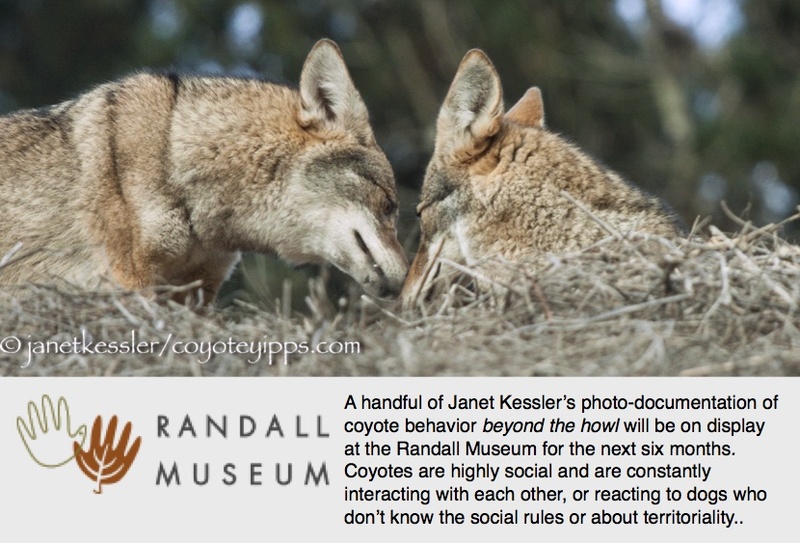 Coyote society is highly socially organized according to dominance and pack loyalty, so it comes in handy. Related to this is showing the tip of the tongue. I see this as a small kiss. It appears to communicate the same message as smiling, but in this case, it is almost always when there might have been room for negative misinterpretation of the coyote’s intentions. It appears to be almost as a gesture of apology. A Hunting Episode — With A Surprise. . . For Me? dropping the prey for me? My attention was drawn to the lone coyote hunting in some tall grasses because of a huge unleashed dog which went after it and because of the owner who yelled out for her dog to return. That’s one way to locate a well camouflaged coyote! Surprisingly, the dog returned. The owner leashed her dog and continued on her run. I watched as the coyote watched them leave: the coyote was alert and could easily have fled, but he kept cool and walked casually on a few paces. For the next hour I would watch this coyote hunt. . . . and then I was rewarded. Within the span of that hour the coyote didn’t travel far. He moved slowly. He seemed always to be aware of where the prey might be. For instance, he moved 50 feet off the path to a specific spot — had he heard the prey? He stopped and stared at the ground, and the unfortunate meal was caught without much effort. This continued as the coyote went through a plethora of voles and finally a large gopher. It’s this last gopher of that hour that received the bulk of the coyote’s attention. This might have been because the coyote already had a full stomach. The coyote seemed to have sensed it from 25 feet off the path. He moved slowly towards it, looking around, climbing over a fallen tree trunk, and finally zeroing in on the exact spot where the gopher was. And then, he exercised extreme patience: he waited and waited, triangulating his head to zero in on the exact location, moving very little. Finally, the pounce happened and the coyote caught his prey. But this didn’t mean the hunt was over. The unlucky victim managed to escape, to begin with. Coyotes seem to be able to find needles in haystacks, and in that dense and high grass the coyote re-located his prey. But neither was this to be the end of the hunt. Instead of wolfing it down, the coyote watched it, poking it now and then, and sometimes looking at me. I sat back, hoping the ordeal would be over quickly. It wasn’t. And then, with the prey still wiggling a little, the coyote began walking in my direction with his catch, and then. . . . . he dropped the prey in front of me. Oh, no! Was it an offering of friendship? This particular coyote has been allowing me to watch him for almost two years. I always keep my distance — I don’t want to be brought into his “circle” of activity or to interact, ever — but maybe he thought differently? My observations are strictly about being on the outside and watching in. I immediately, but ever so slowly and carefully, distanced myself further from the scene. The coyote peered at me as I moved off. Maybe he thought that I was an idiot for not accepting his generosity — either his friendship or the gopher? Seeing that I was not interested, he picked up the prey and slowly walked off with it. I lost him for a short time, and then saw him again, finishing off his meal — not swallowing it whole as it is usually done, but tearing the food apart this time. It really was a large gopher — a prize.